One of the great things about a DD-WRT router is that you can do lots of things with it (as well as using it for VPN of course!). 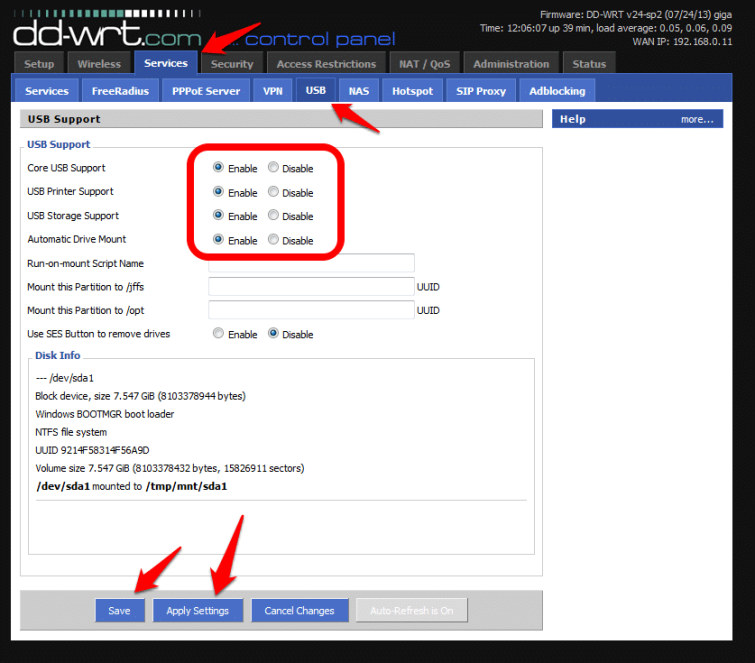 If your router has USB slots (as the RT-ACU66U does), then you can plug in a USB hard drive and use it as Network Attached Storage (NAS) - a centralized storage hub that every authorized person on your network can access. 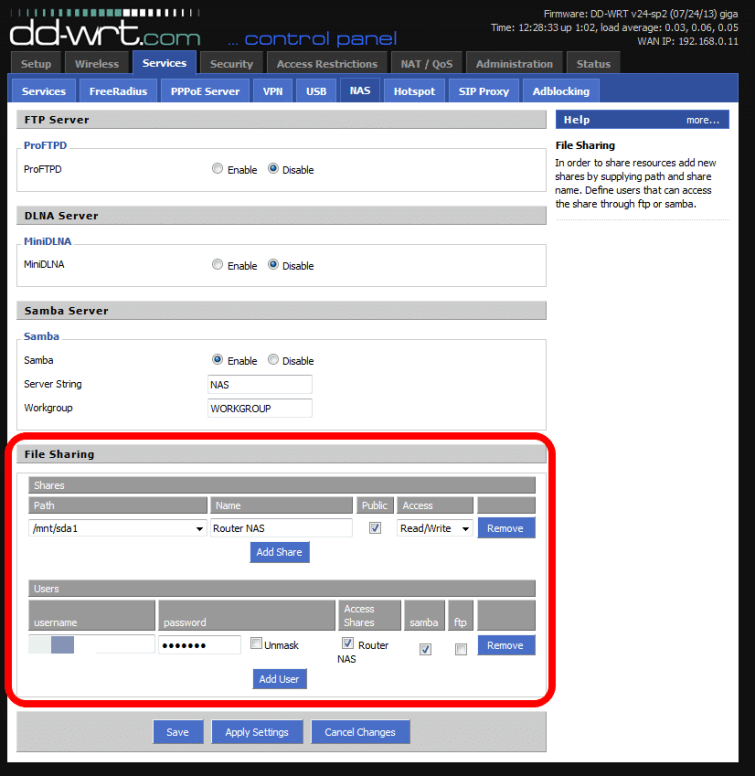 If you'd like to know more about DD-WRT, we'd also recommend reading our huge DD-WRT Guide. This is great for sharing files or resources in the office, or acting as a centralized media streaming server in the household, so that family members can view or listen to a shared library of movies, music or photos, using any computer, smart phone, smart TV, tablet, or other network connected device. 1. Attach your USB storage to the router and power it up (if needed). 2. 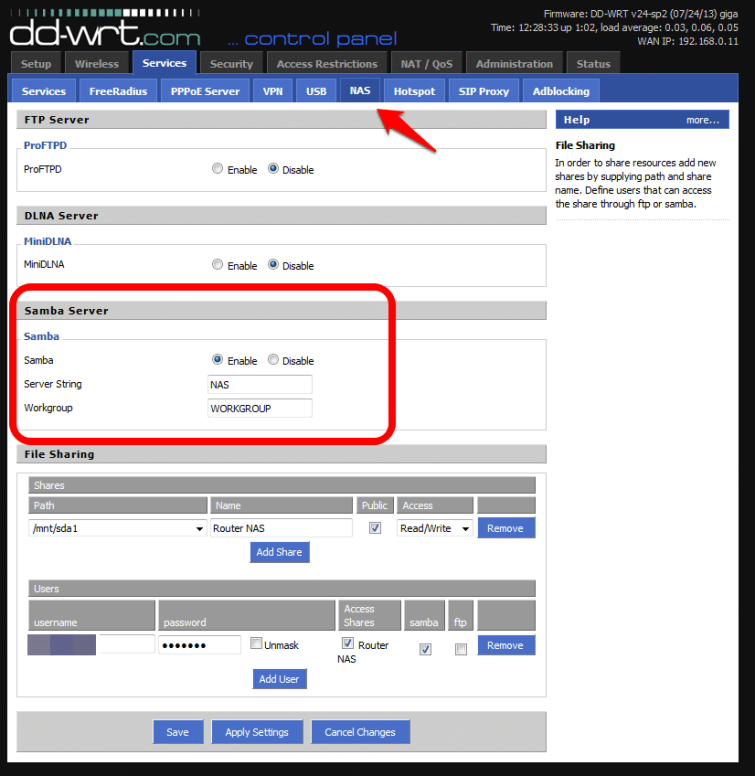 Enter your router config page by typing the router IP address (usually http://192.168.1.1/) into your browser address bar. Click on the ‘Services’ tab, and then the ‘USB’ tab. 3. Enable ‘Core USB Support’, ‘USB Storage Support’ and ‘Automatic Drive Mount’. If you have a spare USB port and want to connect a printer for wireless printing, you can enable ‘USB Printer support’ as well. Click ‘Save’ and then ‘Apply Settings’. 4. Details about your USB storage device should appear in the ‘Disk Info’ section. If they don’t, then re-start the router and come back to this page. In Linux / Ubuntu to install Samba, open up a terminal window and issue the command: sudo apt-get install samba smbfs (you will need to enter your sudo password). Go to the /etc/samba/smb.config file and look for the line 'workgroup = WORKGROUP'. 6. Under ‘File Sharing’, click Add share, select a storage device or device partition from the ‘Path’ dropdown menu, and choose a name for the storage. 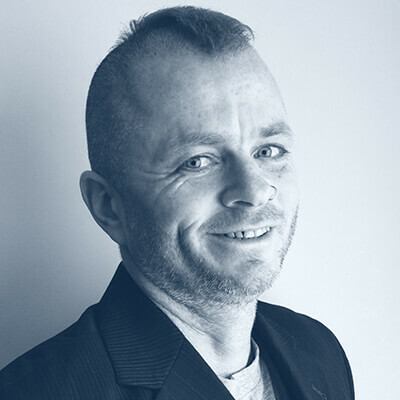 If you want everyone who joins the network to be able to access the NAS storage then check ‘Public’, and decide whether permission is Read/Write or Read Only. In Linux / Ubuntu follow these instructions. Mobile devices should also be able to access the NAS drive, but the specifics depend on which app you use. Thank you, I followed the steps and finally I can setup my HD USB 2.0 (1TB) with router Buffallo WZR-HP-G450H with DD-WRT 3.0 build 30949, it was only possible conecting in this way => Router HUB USB 3.0 HD USB 2.0 1TB. Hi, I just tried this tutorial and I got everything working, except that it mounts the drive as read only apparently. When I try to write to it it asks for a username and password (even when he already has my username and password from when I mounted the samba partition) and then I get an error that I have no permissons. 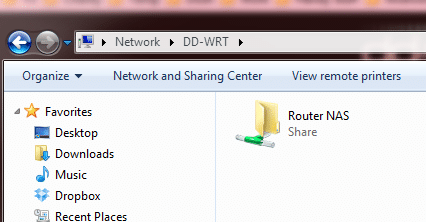 I selected read/write in ddwrt webif. I can only see a Lost+found folder. When I click on the "public" option it doesn't ask for a username the second time, but I still can't write to the disk. The disk is ext3. Any clues? Hi Damian, Have you tried Sharing the drive (right-click drive -> Properties -> Sharing)? Hi neal, I'm afraid I'll have to throw this one out to our readers. On my DD-WRT router I can transfer files to a Fat32 drive up to 4gb (the file size limit of Fat32).